Annan Athletic vs Stirling Albion matches traditionally produce plenty of goals and this match certainly did not disappoint unfortunately for the Binos it was Annan who did most of the scoring to produce an emphatic win which maintains Annan’s push for the play offs. It was a match of two halves with Stirling dictating the flow of the first half and Annan totally in control in the second half with some superb attacking football, scoring 4 goals for the first time this season. Stirling got off to the best possible start going ahead in the seventh minute and it was a scrappy goal scored by ex Annan forward Blair Henderson who managed to get his shot away whilst on the seat of his pants inside the six yard box. 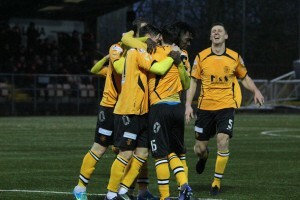 It was a disappointing goal for Annan to concede so early on but the goal gave the visitors some initiative. Blair Currie then denied Henderson in the 19th minute as the visitors went all out to double their lead. Annan’s first real opportunity in the 25th minute was created by a penetrating Osadolor run which ended with a lay off to Flanagan who failed to take advantage of the promising build up. Rabin Omar was fouled in a promising position to win a free kick on the edge of the box but the normally clinical Weatherson failed to test the keeper with the shot striking the Stirling Wall. A minute later Darren Ramsay tried his luck but the shot went woefully wide. Darren Ramsay was booked for a challenge on Colquhoun and Jeffries well struck free kick from 25 yards went narrowly past the upright. Annan made the breakthrough almost on the stroke of half time, it was a well constructed move created down the left by Jean Guy Lucas who slipped the ball into the path of Rabin Omar who squared the ball from the bye line back across the face of the goal for Smart Osaldolor who only needed to touch the ball into the goal from 4 yards, it was a simple goal but one the visiting supporters would feel Annan did not deserve. The goal certainly gave Annan a lift going in at break and it was a rejuvenated Annan who started the second half with their tormentor in chief Nathan Flanagan’s direct penetrating runs down the flank creating all sorts of havock in the Stirling defence. It was Flanagan who set up Rabin Omar in the 55th minute with Omar’s shot being blocked. Minutes later the trickery of Flanagan opened up the Stirling defence after a superb run down the wing ended with the player cutting along the bye line before slipping the ball across the face of the goal where once again Osadolor was at hand to slot the ball over the line from close range. Stirling were being put through the ringer and Flanagan then went close finishing with a shot which hit the side netting. Annan were in the mood but it was not until the 74th minute that they made the breakthrough when Peter Weatherson set up substitute Max Wright who finished with a cracking volley into the corner of the net from 15 yards. Stirling were struggling to contain Annan’s direct play and they found it difficult to mount any serious threat to test Blair Currie in the Annan goal. Stirling’s misery was completed in the final minute of the match when Annan carved open the beleaguered Stirling defence with substitutes David McKenna and Max Wright combining with Max Wright heading into the net from close range after Wright’s pin point cross was perfectly placed to match the run of Wright. It was another superbly worked goal on an afternoon which must have left the Binos wondering what went wrong in the second half especially after a promising first half . For Annan to reverse the situation there must have been a few harsh words spoken at half time as the football played Annan in the second period was top notch and was in complete contrast to that produced in the first half. It was a good day for all the front runners but the battle to avoid the fated bottom slot looks like being fought out to the end of the season with only 3 points separating the bottom 4 teams Berwick Rangers, Cowdenbeath, Edinburgh City and Stirling Albion but with 15 games to go there are 45 points up for grabs and no doubt there will be a few twists and turns to unfold. Annan Athletic : Blair Currie, Jean Guy Lucas, Callum Home , Raffi Krissian, Peter Watson, Gavin Skelton, Rabin Omar , Darren Ramsay ( Max Wright 68 min), Peter Weatherson, Smart Osadolor (Aiden Smith 78 min), Nathan Flanagan ( David McKenna 84 min). Substitutes not used – Alex Mitchell, Steven Black, Przemyslaw Dachnowicz, Steven Swinglehurst. Stirling Albion : Chris Smith, Liam Caddis, Connor Quigley, Scott Davidson, Frazer Wright, William Robertson (Andrew Black 85 min), Gavin Colquhoun ( Sean Dickson 70 min), Connor McClaren, Darren Smith, Blair Henderson, Josh Jeffries.. Substitutes not used Cammy Vinnie GK, Ross Forsyth, Jamie Mills, Darren Petric, Ross Cameron. Referee Grant Irvine, Assistants Joseph Lawson and Ross Menzies.